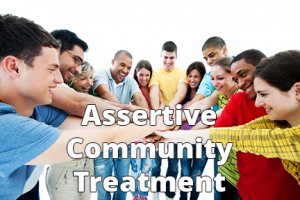 Assertive Community Treatment (ACT) is an Evidence-Based Practice (EBP) designed to provide comprehensive treatment and support services to individuals who are diagnosed with serious mental illness. ACT services are provided by a multidisciplinary team and are designed to be provided in the most integrated setting possible to maximize independence and community integration. KEY COMPONENTS: All ACT team members know and can work with all individuals served by the team. Team members do not carry individuals caseloads, rather the entire team is responsible for the entire caseload. Team members meet daily to coordinate services for ACT participants. ACT teams are typically staffed at a ratio of 1:10 (meaning 1 full time team member for every 10 individuals served by the team). The ACT team includes: a team leader, a licensed medical practitioner (psychiatrist or PMHNP), nurses, therapists, substance abuse specialists, supported employment specialists, peer support specialists, case managers, and other mental health specialists. Please click here to learn more about the multidisciplinary team. Rather than brokering out services, the ACT team provides almost all treatment services, which includes: case management, counseling / psychotherapy, psychiatric services / medication management, crisis services, integrated dual disorder treatment, employment and education services, and housing support. While ACT services are individualized to meet each person’s needs, because of the high acuity of ACT participants, they are typically seen on average of 4 times a week. Most services (80%+) are provided in the community where people live and work. Contacts in natural settings are more effective than in office settings, as skills may not transfer well to natural settings. Services are provided for as long as an individual wants and needs intensive treatment. New research indicates that after four years in an ACT program, around 14% of individuals may be ready to consider transition to less intensive services. ACT teams use a transition readiness assessment tool to help determine when individuals may be ready to step-down to a lower level of services. Transitions should be gradual with assured continuity of care. ACT services are intended for individuals who have not been able or willing to engage in traditional services. Engaging individuals in ACT should involve community-based outreach strategies designed to meet people where they are (both literally and figuratively). The process is dedicated to discovering what individuals most need and want and meeting those needs to connect with and motivate them. Work and education are keys to achieving personal goals, financial self-sufficiency, and improved quality of life. The ACT team supports everyone receiving services who chooses to pursue education and employment by providing these services directly. The ACT team works with individuals to re-store or build new valued social roles, which includes helping individuals to identify and strengthen their natural supports outside of the mental health system.